Before you begin working your way to foreign language fluency, it helps to understand the culture behind the language you’re learning. After all, language exists to help a group of people express their ideas and beliefs. Russia is a vast country with a rich history and culture. As you begin your Russian language program, gaining a strong grasp on this history, the values, and the etiquette will help you rapidly achieve success. In particular, using transportation in Russia can be tricky. There are two passenger car travel options in Russian. One is renting a car from an agency like Hertz or Avis. To rent car from these agencies, a traveler must be 18 years old, and able to carry some form of insurance. The other option is booking service with a private car and driver. The second option is best for many travelers because it eliminates the need to know the laws of the highway, and how to negotiate difficult roadways. It is no international secret that Russian roadways are filled with reckless drivers. Excessive speeding and other dangerous driving behaviors are very common. 37 mph is the most common city speed limit, while 56 mph is the prevailing freeway speed. Though these safety limits are posted everywhere, Russian traffic flows seem to completely disregard them. Local car drivers are adept at keeping travelers safe on the roadway, and exercise great levels of reserve. If a traveler elects to rent a car, they should be aware that the Russian road systems are patrolled heavily by the GAI. All travelers should carry a license, registration, rental agreement, and Visa when driving. Travelers could encounter several types of distracting road warnings about maintaining proper speed limits. They will also encounter strange and erratic behaviors by other drivers. Like other countries, driving in Russia is best done with a keen sense of defensiveness and caution. Everyone traveling to Russia must understand that it is a huge country in terms of land mass. Its reach is literally hemispheric in scope. This means that the vast majority of travel in the country is done using a complicated and vast system of roads. Many of these roadways meet international standards for safety and convenience, but others are still quite dangerous to travel. Many of the roads in Russia that are being modernized are the same roads that have existed for centuries. Incredible amounts of local lore and history are intimately tied to the mystique surrounding traveling Russia’s great landscape. It is said that walking Russia’s roads is like taking a trip through time itself. According to one noted author, Russia’s roads are similar to fools in that they are one of the country’s greatest misfortunes. Navigating Russia’s roadways however, is not as daunting as some legends would suggest. They only require planning, caution, defensive driving, and an amount of good common sense. Like many industrialized nations, Russia is lacking in infrastructure improvement. The job of maintaining Russia’s roads is incredibly difficult. For this reason, Russia experiences a large number of roadway accidents and fatalities each year. This is due partially to road conditions, but more so to the inexperience and aggression of drivers. More than 350,000 deaths have occurred on Russian roadways in the past decade. Many alternative forms of transportation are now being offered to counter the problem of Russia’s roadways. Small private airline charters offer travelers an option over the choice to drive the countryside. Many of these charters operate without the advantage of government regulation, and present many dangers to visitors themselves. Larger airline services like Aeroflot (“Аэрофлот”) however, offer reliable services throughout the country. Light rail trains are a great way to get around Russia, but travelers should know that the types of trains taken vary in style and amenities. Transit rail that travels between metropolitan centers like St. Petersburg and Moscow are extremely modern. They offer many conveniences like restrooms and sit-down booths. Other rail vehicles in Russia reflect the locations that they serve most often. Modern Russian rail transport systems operate on strict passport schedules. This means that lines like the Red Arrow will streamline bookings with only a few days advance notice. A significant portion of the Russian population uses rail transportation systems on a regular basis. In general, there are three types of Russian rail travel. The luxury class system includes private sleepers with beds, called as “СВ” or “люкс.”“Купе,”coup-class travel, includes certain luxuries, but has the imperative of sharing space with other travelers. The least comfortable train travel arrangement is “плацкарт.” This is an open-bunk and seat arrangement that affords little privacy, but is always affordable. Many changes to laws regarding this class of travel have been made by the Russian government. Attention is now being made regarding the varying needs of male and female travelers. Whenever a tourist chooses to use the rail systems in Russia for cross-country travel, they elect to interact with a wide variety of people. Travelers should understand that the rails are a popular form of travel for many local people. They will likely encounter a wide array of individuals who use the train to travel for various reasons. Russian train rides are full of opportunities to share stories and languages with diverse individuals. 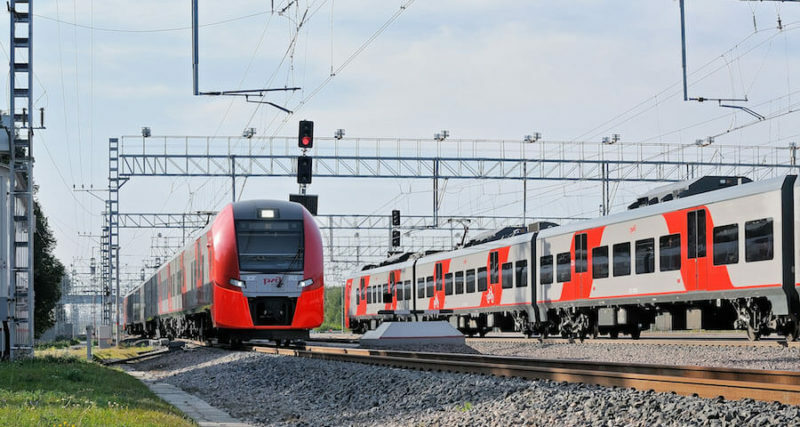 “Метро” is a modern rail system that has been implemented to circumnavigate the problems associated with overland train travel in Russia. This system is operated using a strict Cyrillic language system, but is available to anyone visiting Russia and who wants to avoid difficult overland routes. The Metro system is color coded for easy navigation, and localized by color code. Moscow for instance, is color-coded with brown markers and time indicators. “Метро” is one of the main travel modes used by Russia’s working population. It is extremely busy during the rush hours of 8-9 a.m. and 5-7 p.m. Its operational hours are only closed during the waning hours of the morning, but are active from 5:30 a.m. to 1:00 a.m. each day. Every travel ticket price is calculated based on the number of rides you plan to take. Russia takes pride in its Metro system. Each Metro station is adorned with attractive architecture and historically interesting features. Station “Комсомольская” is a model of baronial art, while stations “ПлощадьРеволюции” and “Киевская” feature provincial themes. Each of these stations is as extravagant and intriguing as the many museums promoted throughout the Russian city network. The Russian Metro system includes service by bus, rail, trolley, and streetcar. Visitors should be aware that the schedules for these services are loose. It is not uncommon to wait for an hour past scheduled arrival times to connect with a vehicle. Though each mode of transport is easy to see with color-coded signs and directions, many connections can be missed. These connections only operate at night. If a connection is missed in the early morning hours, there are taxis available to cover the missed routes. Catching a taxi cab in a large Russian city is a matter of phoning-in a request, and looking for a specific car model and number. This is not unlike any taxi service in any other big city, but it does require patience and watchfulness. Many of Russia’s larger cities are travel hubs. They are bustling with activity. People ordering taxi service should be constantly aware of the details surrounding their service. Unlike many urban systems, Russian taxis are highly independent. They operate on a profit-driven basis. Taxi drivers can turn down passengers if their destinations are not profitable. This is true even for travelers making scheduled pick-ups. Fortunately, there is a vibrant network of independent car drivers who specialize in serving tourist needs. A little hitchhiking skill is needed, but travelers can find excellent city service simply by hiring local drivers. These drivers do not work for companies, but they offer extraordinary service for paying patrons. This type of private service is best utilized during daylight hours. Pay-as-you-go buses are always operating around metropolitan areas. These are wonderful options instead of hiring a private driver. These buses meander through city routes, and stop anywhere that a paying patron desires. Simply look for a sign that indicates a bus stop and has a company moniker like “маршрутка,” look for vacant seats, and ride anywhere. Though disembarking one of these buses might require a walk to a final destination, the ride is safe, comfortable, and affordable at any hour. Debuting in 1935, the Moscow Metropolitan was constructed as a part of Soviet propaganda. With its architectural designs, a keen observer can note the real intention of the structure. It was initially intended to predict the success (“светлоебудущее” or bright future) of the empire with “свет” or light as the design principle. The Soviet Union leaders’ busts, such as Lenin, are all over the Moscow Metro today. There are also murals in which the elements of the Soviet propaganda, including the Homo Sovieticus, can be observed. You can even say that the Metro is comparable to a Russian museum. When it first opened, Moscow Metro ran for 6.8 miles and only had 13 stations. It is considered the first ever underground railway system in all the Soviet Union countries. Even until today, it is still mostly underground. The deepest section is believed to reach 276 feet below the surface, which is at the station “ПаркПобеды” and is currently one of the world’s deepest parts as well. However, it now has over 200 stations, and the length of the route is at least 210 miles – the fifth longest line in the world. The Moscow Metro is among the busiest subways in the whole planet with billions of people using it each year. Indeed, the Metro holds a few bests, including a world record of accurate times for departure and arrival. The Moscow transport department claims the Metro is 99.99% on time, which is quite impressive since the interval between trains is only 90 seconds during rush hour.